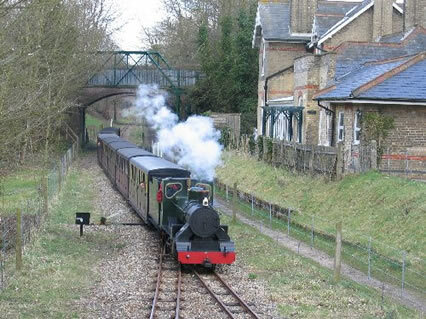 The Bure Valley Railway opened in 1990 and runs over a nine mile section of former Great Eastern track bed between the ancient market town of Aylsham and the "Capital of the Norfolk Broads ", Wroxham. We start our journey at Aylsham, headquarters of the line which includes the locomotive workshops, large restaurant and souvenir/model shop, all with full wheelchair access. After passing through the idyllic Norfolk villages of Buxton, Brampton, and Coltishall we arrive at Wroxham. 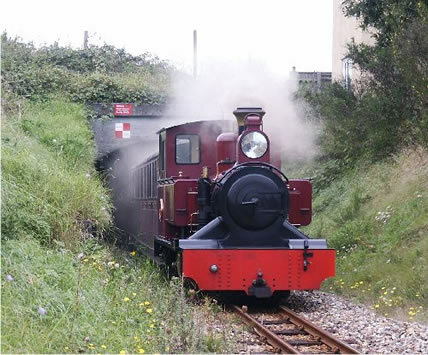 Originally operated by loco’s hired from other railways such as the Romney Hythe & Dymchurch and Bressingham. The Bure Valley Railway now boasts five steam locomotives and three diesels, purpose built or adapted for the many gradients on the line. Opening Times: Please visit the Bure Valley Railway Website for details. Fares: Adults Return (Rover) £12.50, Children Return (Rover) (6 - 15) £6.50, Under 5’s Free except on Special Event days when Under 3's Free (when accompanied by a full fare paying adult - maximum 3 per adult) (Excludes Santa Special services). BVR Page was last updated on the 3rd April 2013 with fares updated.